Discussion in 'Sesame Appearances' started by SamEagle 000, Jun 23, 2003. When I saw the Sesame Street characters on the Simpsons trying to kill Homer I thought it was kind of funny at first but then I got kind of offended. The characters were badly drawn and they were trying to Kill Homer. Let me repeat, Kill ! I couldn't believe it. 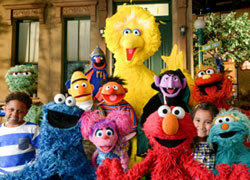 The characters on Sesame Street would never kill any one. It was all wrong. At one point, Elmo was in Oscar's trash can and Big Bird was flying! Was anyone else offended? Nope, I thought it was great. It was only a parody, the Muppets do the same thing. Actually, a friend of mine designs haunted house attractions and one scene was a badly built, dimly lit SS set, with blood splattered everywhere, and there was green fur hanging out of the trash can and blood splattered on windows, and when the people came by the steps "Bert is Evil" came running down the steps from 123 Sesame Street with a huge blade in his hands. He had bought the head from a costume shop and restored it. The idea came from the "Bert is Evil" website. I wasn't offended by The Sesame Street characters on the Simpsons in the least bit. I thought it was great! Like was said, it's a parody. I think we're all old enough to take what we can give out. I found that part very funny. "Elmo know where you live!" When I first saw it was kind of offended but then when I saw it again I found it pretty funny. I figure the Simpsons are pretty much known for their parodies so I couldn't really find it too offensive anymore. I do think they could have done a better job with the drawings of the characters though. I think we're all old enough to take what we can give out. You kidding? It was satire, not an insult (unlike Crank Spankers or whatever). Ehhm, guys, SamEagle 000 is pretty young. Yeah, Tommie, I know now. SamEagle 000, I understand where you're coming from (that a-way? No, that a-way!). It can be upsetting at first, but, I just think of it as picking fun on an old friend. The Simpsons writers are Muppet fans (one of them co-wrote IAVMMCM), and they don't pick on SS anymore than Ernie picks on Bert. When Elmo says no, Elmo mean no! I guess your right. And yes, I am young. I'm only 11. Now that I think about it some of the parts were funny. Like, "Elmo know where you live!" Wouldn't The Simpsons have to get permission to do this. Did Kevin Clash play Elmo? Then it would DEFFENITELY be good. No it was funny!!! Nothing to harm in good ol fun! Yesterday's episode began with a dream of Homer, in wich he was Yogi Bear and Bart, ehhhm, that small bear. I love those parodies. 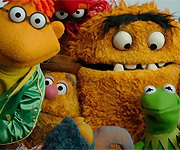 When I saw the Muppets Go Medevil bit, I thought it was Steve doing Kermit's voice. Then again, many people have their own Kermit so it could have been anyone. I think to get offended by satire is political correctness gone a muck. These days, people don't usually take jokes as jokes, but instead as an assualt on them in some way. Crazy world. What are you talking about having to be ten characters long? (Actually I just typed "What?" and saw this new messages saying "The message you have entered is too short. Please lengthen your message to at least 10 characters." which is kind of annoying, but at least I now know what you mean.